Charles Nordhoff : Surf-Riding at Hilo, 1873. 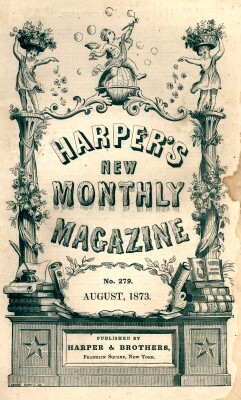 Harper and Brothers, New York, August 1873. A footnote on page 382 notes that Hawaii Nei "is the title of the collective kingdom of Hawaii. Hilo Bay was a significant surfing location on the east coast of the big island of Hawaii. The article has a number of unaccredited illustrations, such as the scene of Waikiki on page 385, see below. However, the woodblock print, Surf Bathing on page 399, is accredited in the text as based on a sketch "by Lieutenant- Commander William Bainbridge Hoff of the flag-ship California." William Bainbridge-Hoff (1847-1903) had long career in the U.S. navy, a noted maritime illustrator, and was the author of several standard works on naval tactics. He apparently produced the sketch and met Nordhoff in Honolulu while serving on the California, which visited twice between 1871 and 1873 as the flagship under two US Rear-Admirals. The article and the illustration, without the accreditation, were reprinted in Nordhoff's Northern California, Oregon and the Sandwich Islands, Harpers and Brothers, New York, 1874, pages 52. Knox, Thomas W.: The Boy Travellers in Australasia (1889), page 32. This book was also published by Harper & Brothers, facilitating the image's reproduction from the earlier publication. The image reproduced below is scanned from Knox. In 1890, in a presentation on surf riding augmented by his photographs, Dr. Henry Bolton considered Hoff's illustration an unrealistic representation. - Bolton, Dr. Henry: Some Hawaiian Pastimes, Journal of American Folklore, Volume 4, Number 12, January-March 1891, pages 21-25. The book was reprinted in 1974 by Ten Speed Press, California, where the illustration and text appear on pages 51-52. Hilo - on those days when the sun shines - is one of the prettiest places on the islands. 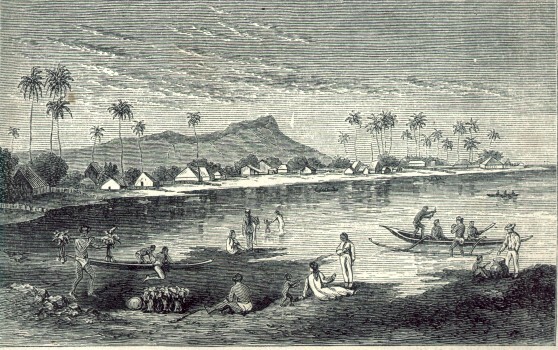 If you are so fortunate as to enter the bay on a fine day, you will see a very tropical landscape- a long, pleasant, curved sweep of beach, on which the surf is breaking, and beyond, white houses nestling among cocoa-nut groves, and bread-fruit, pandanus, and other Southern trees, with shops and stores along the beach. Men bathing in the surf, and men and women dashing on horseback over the beach, make up the life of the scene. Hilo has no hotel; it has not even a carriage; but it has a very agreeable and intelligent population of Americans, and you will find good accommodations at the large house of Mr. Severance, the sheriff of Hawaii. If his house should be full, you need not be alarmed, for some one will take you in. Finally, Hilo is one of the very few places on these islands where you can see a truly royal sport- the surf-board. It requires a rough day and a heavy surf, but with a good day It is one of the finest sights in the world. The surf-board is a tough plank about two feet wide and from six to twenty feet long, usually made of the bread-fruit-tree. Armed with these, a party of tall, muscular natives swim out to the first line of breakers, and, watching their chance to duck under this, make their way finally, by the help of the under-tow, into the smooth water far off beyond all the surf. Here they bob up and down on the swell like so many ducks, watching their opportunity. What they seek is a very high swell, before which they place themselves, lying or kneeling on the surf-board. The great wave dashes onward, but as its bottom strikes the ground, the top, unretarded in its speed and force, breaks into a. huge comber, and directly before this the surf-board swimmer is propelled with a speed which we timed and found to exceed forty miles per hour. In fact, he goes like lightning, always just ahead of the breaker, and apparently downhill, propelled by the vehement impulse of the roaring wave behind him, yet seeming to have a speed and motion of his own. 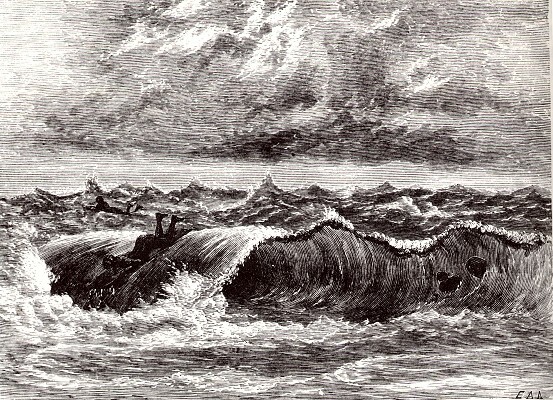 It is a very surprising sight to see three or four men thus dashed for nearly a mile toward the shore at the speed of an express train, every moment about I to be overwhelmed by a roaring breaker, whose white crest was reared high above and just behind them, but always escaping this ingulfment, and propelled before it. They look, kneeling or lying on their long sun-boards, more like some curious and swift-swimming fish -like dolphins racing, as it seemed to me- than like men. Once in a while, by some mischance the cause of which I could not understand, the swimmer 'was' overwhelmed; the great comber overtook him; he was flung over and over like a piece of wreck, but instantly dived, and re-appeared beyond and outside of the wave, ready to take ad vantage of the next. A successful shot launched them quite high and dry on the beach far beyond where we stood to watch. Occasionally a man would stand erect upon his surf-board, balancing himself in the boiling surf without apparent difficulty. The surf-board play is one of the ancient sports of Hawaii. I am told that few of the younger generation are capable of it, and that it is thought to require great nerve and coolness even among these admirable swimmers, and to be not without danger. For the sketch of it which accompanies this article, as well as one of Kilauea, I am in-debted to the skillful pencil of Lieutenant- Commander William Bainbridge Hoff, of the flag-ship California. William Bainbridge-Hoff (1847-1903) had long naval carreer, a noted maritime illustrator, and was the author of several standard works on naval tactics, some of which have been translated in several languages. "The first California, a screw sloop, was launched 3 July 1867 as Minnetonka at Portsmouth Navy Yard; sponsored by Miss M. Bailey; renamed California on 15 May 1869; and commissioned 12 December 1870, Captain J. M. B. Glitz in command. On California's second cruise, 30 December 1872 to 25 May 1873, she flew the flag of Rear Admiral A. M. Pennock, commanding the North Pacific Station, and sailed to Honolulu to supervise the protection of American interests in the then independent island group." Examples, Conclusions, and Maxims of Modern Naval Tactics, Griffin, Portsmouth. 1885. Elementary Naval Tactics, John Wiley & Sons, New York. 1894. USS Ossipee (1862-1891): General Muster on board, circa 1887-88. Note the Marine sentry at the gangway, hammock stowage, and large percentage of black sailors among the crew at left. William Bainbridge Hoff came from a family with strong naval traditions, the grandson of Congressional Gold Medal Recipient William Bainbridge. William Bainbridge was born in Princeton, New Jersey, on 7 May 1774. He went to sea in the merchant marine in 1789 and was captain of a ship before reaching the age of twenty. He was later Commandant of the Boston Navy Yard, served as a Naval Commissioner in 1825-1828 and then was Commandant of the Philadelphia Navy Yard. Bainbridge returned to the Boston command in 1832,"
This web page also includes details of four US Navy ships named Bainbridge. Cropped from Holmes: Hawaiian Canoe (1993), page 77. Surfers and Alaia, Hilo Bay, Hawaii, circa 1900. Geoff Cater (1997-2018) : Charles Nordhoff : Surf-Riding at Hilo, 1873.